Following a thread on the Time-Nuts mailing list, I wanted to check the RF leakage from my Sears microwave oven. This is a relatively expensive model, intended to be bolted to the wall above the cooking range. Some table-tops models can be bought for much less than $100, but this model was about $600 if I recall correctly. 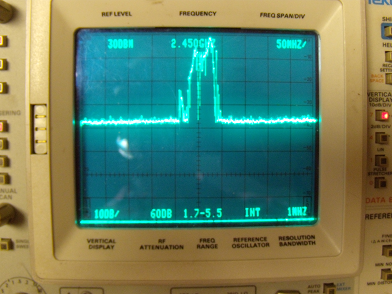 The Spectrum analyzer senses RF through a small rubber duckie antenna from a VHF walkie talkie. The antenna is about 1 foot from the oven, somewhat aligned with the seam along the lower left corner of the door. And here is the data, collected with the spectrum analyzer in peak-hold mode for about 2 minutes. Please note the peak level is almost +30dBm (1W!!!) and the occupied bandwidth is almost 100 MHz. I am not sure what the regulations are for this type of equipment, but 1W peak sounds high to me. 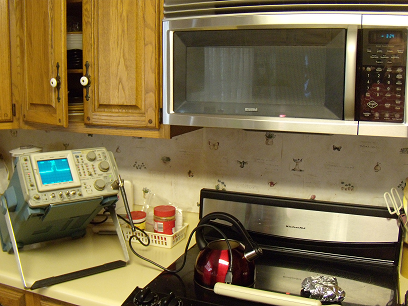 I later looked at the signal with a crystal detector driving a scope (not storage), and the signal shape is roughly that of a 60Hz sinewave half-wave rectified, indicating that this oven uses a simple transformer-based supply, not a switching supply. I will try to take a picture of the signal with the storage scope later and post a picture here.